If you don't know where Houston is, you might think it was "lonesome in this old town" like Dean Martin told us in 1965. It is true in a relative way, as it is currently the 4th biggest city in the US. In 1965, it was #7. Just as iconic as the city it was born in was KILT. This legendary station was masterminded by Gordon McClendon, arguably, the father of top 40 radio. 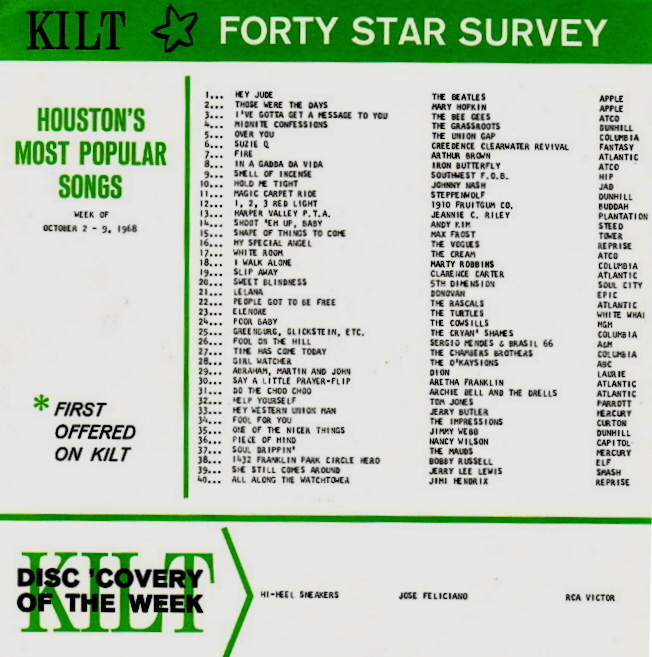 1968 was one of the glory years for this station and its format was still hanging on despite the trend toward tight playlists. Our Cryan Shames are doing well with "Greenburg, Glickstein, Charles, David Smith and Jones" at #25 this week. Does anyone besides me think that this great recording is quite in vogue for the times, considering its chart-mate, "White Room"??? How about a mashup of the two? Dallas' Southwest F.O.B. hit, "Smell of Incense" (the band featured England Dan Seals and John Ford Coley!) was doing quite well in their big neighbor's town at #9. Besides the Shames, Chicago is "representin'" via the Impressions (#34) and Mauds (#37). Hit songwriters get their chance as well with Jimmy Webb (#35) and Bobby Russell (#38), this time as artists! Nationally, it peaked at #73 in Cash Box ... it only managed to "bubble-under" in Billboard, where it stopped at #115! Here in Chicago, however, it was a Top Ten Hit, peaking at #9. And look at In-A-Gadda-Da-Vida in The Top Ten again ... how did this record not chart higher overall in the national trades? (Of course the 2 1/2 minute version really couldn't compete with the 18 minute version that the FM stations were playing ... or that kids were listening to in their basements at the time.) Still, it must have had SOME pop appeal to rank this high. But this week it's a video by The O'Kaysions that I have to share with you. These guys were another One Hit Wonder group out of Wilson, North Carolina. Frannie found this video a few years ago and we were both shocked to see that they were white! 10/6/68 - Now HERE’s a line-up for you … as musical guests this evening, Ed Sullivan welcomed Dionne Warwick, Tony Bennett … and Tiny Tim! How come you haven’t shared YOUR 16-track White Album with us? Like all of you, I’ve had a hard time paring this down as I’ve just become so accustomed to it as it currently sits (and has been embedded in my head for the past fifty years) … but there are definitely a few tracks I could do without. “Long Long Long” is a BEAUTIFUL George Harrison song … I’m anxious to hear the new, more balanced mix that Giles Martin has done … but by late 1968 we were reaching a period where George was starting to show up more on B-Sides (“The Inner Light” had just graced the flip side of “Lady Madonna,” the single they released before “Hey Jude” … and soon he would be featured with the flip sides “Old Brown Shoe” and “For You Blue” ... and even an A-Side with “Something”) … so this would have been a good one to keep that trend going. That gets me down to 20. There are a few of tracks that would have worked well as B-Sides for this one … “Happiness Is A Warm Gun” (although I think I prefer that one as an album track), “Yer Blues” and “Julia,” a complete change of pace track for John and, despite its great sentimental value, never one of my LP favorites. My only hang-up here is that if you WERE going to pull a single from “Yellow Submarine,” I’d find it almost impossible not to select “Hey Bulldog” … but at this rate, we’ve got to be careful as we’re only revamping The White Album and not their entire catalog!!! (lol) Otherwise this could go on forever! So let’s go with a second single (tied into the movie release) of “Ob-La-Di-, Ob-La-Da” backed with “Julia” … and now we’re down to 18. “Birthday” into “Yer Blues” is another great blend … as is “Back In The U.S.S.R.” into “Dear Prudence” … “Dear Prudence” for me is a keeper but that blend will be lost once I pull “Back In The U.S.S.R.” as a single unless I can come up with something creative (and I think I have.) I don’t feel as strongly about “Yer Blues” … and have always felt that “Glass Onion” has been highly overrated. (I feel that far too often John took the easy way out when it came to songwriting during this time period … witness “Being For The Benefit Of Mr. Kite” and “Good Morning, Good Morning.” But he also had some absolute moments of brilliance with “A Day In The Life,” too.) As such, I’d drop “Glass Onion” and “Yer Blues” to reach my final sixteen tracks. You’ve heard these songs a gazillion times … so it should be relatively easy for you to be able to hear the way these flow from track to track in my proposed scenario … and, if not, pull out your cd copy and sequence them this way and see what you think! Thanks again to everybody who participated in our little experiment. They are “While My Guitar Gently Weeps” and “Back In The U.S.S.R.,” obviously the “Fan Favorites” from The Beatles’ Double LP.